So I am back to my favorites...teacups! This is another Rosina in a spring pattern of pink and purple roses and violets in an all over chintz. I LOVE it!!! It just sings of spring to me! I guess it's the violets, really, as well as being a chintz pattern which I love. As I explained on my last post, Rosina had a long history and several permutations through Warrilow, and others to finally have dwindled to production as Queens under Churchill, England, which is still in production in the UK. 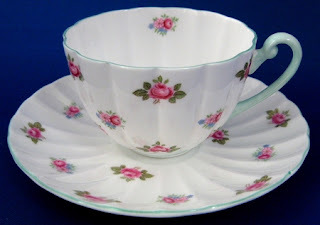 This particular teacups was made in the 1950s. 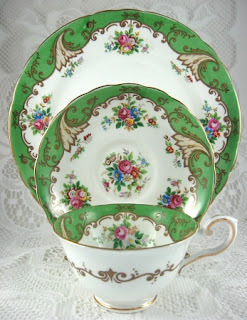 I have 3 of these sets available at Antiques And Teacups, both the ".com", and also at Antiques And Teacups At Etsy. Just click on the photos or the tabs at the top of the blog for more info. 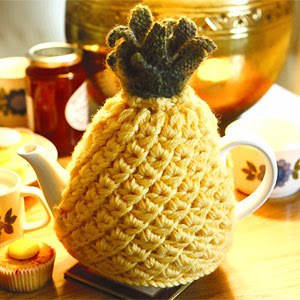 I wanted to share this fabulous knitted pineapple tea cozy. I also posted it on my Facebook page. The fun thing, is that there is a free pattern available for it, which I thought some of you might be interested in. The site is called All About You. Either click the photo or the site name. Cool! I am not a knitter...my gauge doesn't stay even, so I gave up years ago and just do cross stitch. 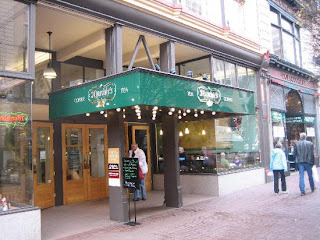 So a short post, but I hope you have some goodies to share about tea, recipes, tea items or tea rooms. I love to read what you post, and am amazed at your skills. Have a great day. 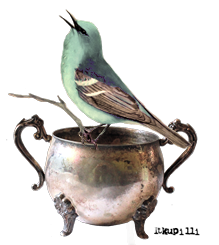 Here is a list of a couple of blogs I will be visiting and the linky. And I love your comments. They are such a blessing! Hi There and welcome to Tuesday Cuppa Tea. 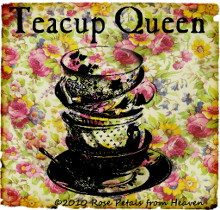 It is so nice to see all the wonderful tea related things all of you talented ladies share! And the wonderful things you share about who you are, what your life is like and what you are doing are fascinating and wonderful. But onto my cup and saucer I want to share with you today. 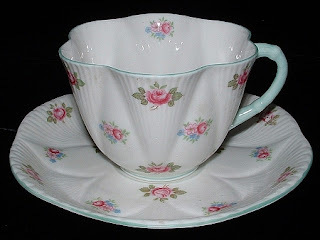 This is a teacup trio made by Rosina, England made between 1948 and 1952 and is my favorite...I go on about that enough you must be tired hearing it...hand colored on transfer floral pattern with an art deco molded swirled bone china shape. I love the rounded square plate. The transfer is grey, then it is hand colored and further embellished with hand painted enamel accents. So neat! Rosina is a favorite manufacturer with a history of change. The pottery started out as G.W. 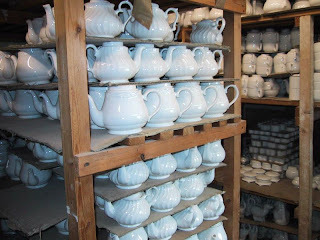 Warrilow and Sons in 1887 in the Queen's pottery in Staffordshire which also produced Queens China. 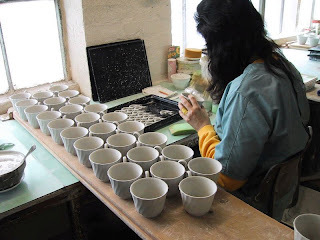 The pottery was taken over in the 1940s by Crownford who continued to produce both Rosina and Queens china under the business name of Rosina until 1994 when the pottery was taken over by Churchill, England. 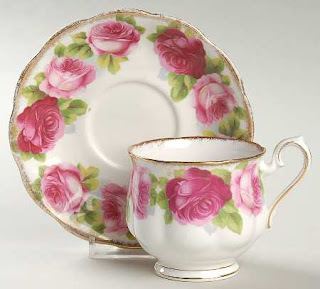 Rosina has been retired, but Queens china is still being produced by Churchill in the UK. Hooray! I love the 1930-1950s designs best though. 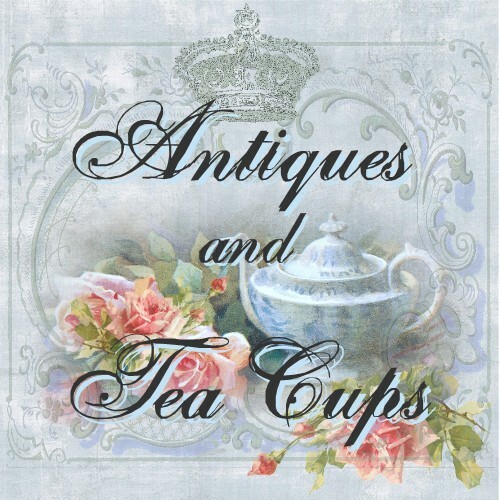 The teacup trio is available at Antiques And Teacups. For more info, click on the photos. What often gets to referred to as high tea is really afternoon tea. 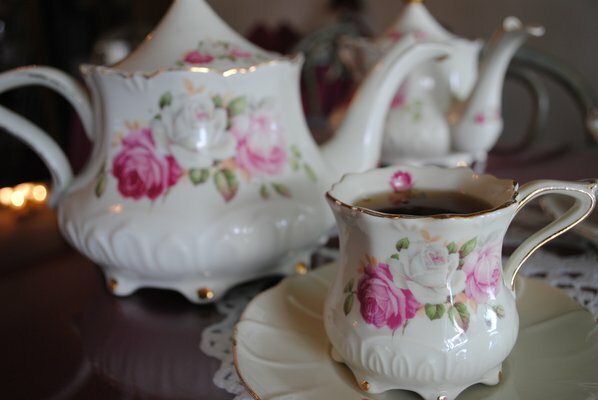 In England, high tea originally meant a more substantial meal including meats, and served later in the day. In some areas of the country and at differing times, the meal is actually referred to as Tea...as in.."I'm off fer me tea" meaning the meal rather than just a cuppa char! This week I made a family favorite stuffed squash, and thought I'd share it with you. 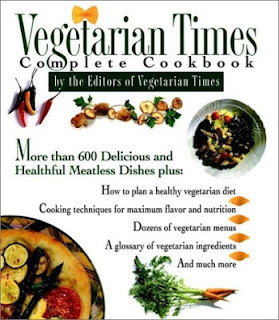 The recipe is from The Vegetarian Times Cookbook. With my respiratory mil allergies, I often am vegan and love the Vegetarian Times. Pile the mixture into the squash cavities. Cover with foil, sprayed with cooking spray on the side that will touch the squash and bake until the squash is tender, about 45 minutes. Acorn will cook faster than the delicata, so check for doneness. Transfer to dish and serve. Makes a wonderful side dish and is festive enough for a holiday table. We love it! So there you have it! 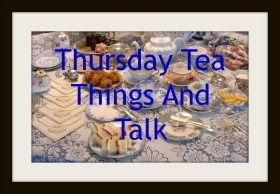 I hope you will visit some of the blogs below, and I would also be honored if you would link to the Tuesday Cuppa Tea linky. Thanks so much for joining me! Hello and welcome to Thursday Tea Things and Talk. 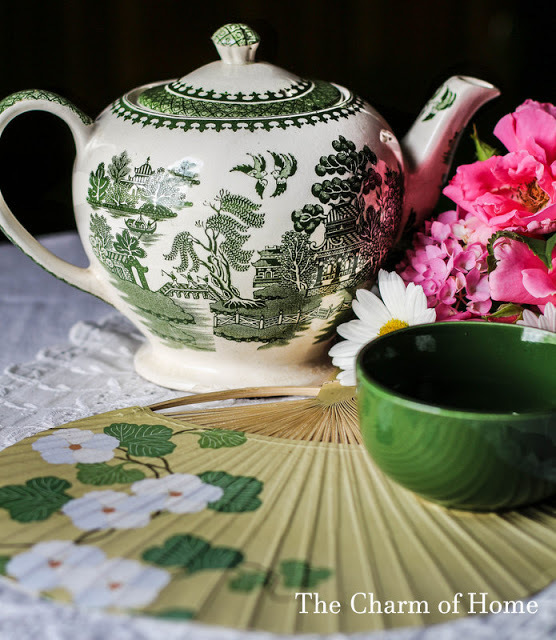 I hope you will share your posts relating to tea...whether a recipe, a teacup or teapot, a visit to a tea room or anything of interest to all of us who love tea, taking it and talking about it! The linky is at the end of the post. I am especially glad to be with you today, as I didn't think it would be possible. I want to thank all of you lovely ladies for your kind words in comments and emails and prayer when I shared my husband has Parkinson's Disease, which I haven't said much about, and his being ill. We thought from Monday evening until Tuesday am he would have to be admitted to the hospital with pneumonia, but Tuesday morning the fever broke and he is recovering. 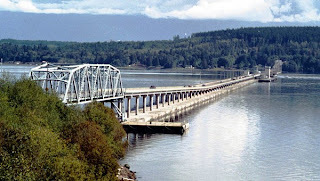 I apologize that I haven't been able to visit, but I will in the next few days try to catch up. I so look forward to your posts. One of the things discussed last week was the way china patterns will differ, although named the same, and why. As I hadn't had anything planned for today, thinking I'd be spending at the hospital, I thought I'd talk about that. 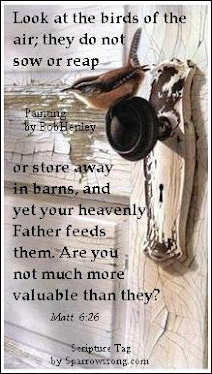 Many of my examples are from Shelley, as I have been dealing with Shelley and researching it for almost 30 years. They also have one of the better lists of patterns. There are many reasons that patterns will differ. Shape is a big one. 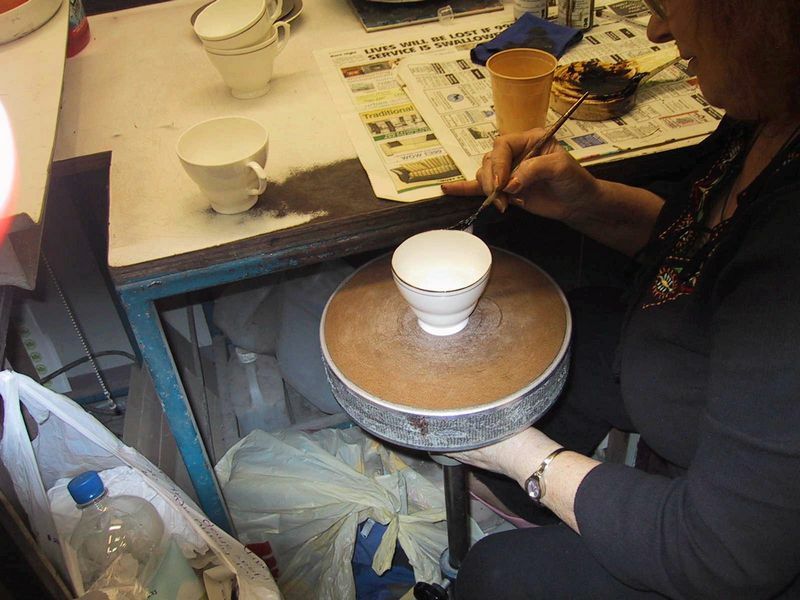 Not everyone likes the same shape of teacups, so the potteries usually have each pattern available in different shapes. Shelley, over the life of the pottery made 142 different shapes. The same pattern might be used on 6-8 different shapes through the years. Tastes, fashions and styles would change, but if a pattern was popular it might be released in a different shape as a complement to a dish set...and frankly, to increase the revenue stream. Think of the variations Royal Albert has made with Old Country Roses over the years. The above photo is the Shelley Rosebud pattern in the Dainty shape, and the photo below is the Rosebud pattern on the Ludlow shape, made at about the same time. 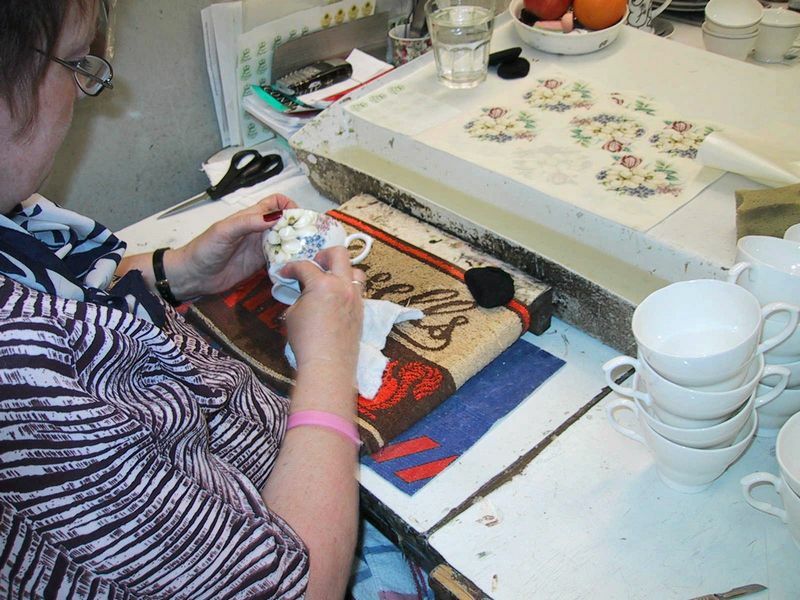 As Old Country Roses demonstrates...which now has a New Old Country Roses patterns, Shelley changed some of it's designs over the years but kept the same name. The following 2 photos are of the Shelley Wild Flowers pattern developed in the 1920s followed by the Wild Flowers pattern that was substituted in the late 1940s when the company felt tastes had changed. The shape on the old Wild Flowers pattern, especially the art deco square shaped plate and the "bean" handle called the old Cambridge from the 1930s was used only infrequently after 1950 as it was felt to be old fashioned. 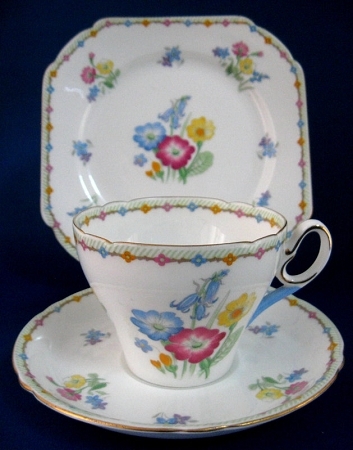 The newer Wild Flowers is on an more"up to date_ pattern called Richmond that was used first in 1938 and continued in use until the pottery closed in 1966. Another difference was in the trim, and vividness of the pattern. 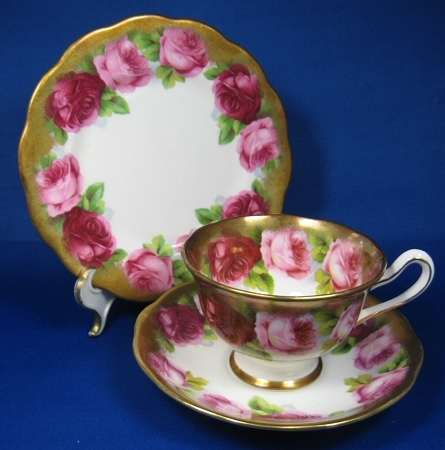 Below are 2 examples of cups and saucers in the Old English Roses pattern by Royal Albert. made at approximately the same time. Note the shape difference as well. The trim on one, although brushed on as opposed to painted on in a line of trim is not where near as lush as the heavily brushed and burnished gold trim of the bottom version. I know this is pretty well scratching the surface of the endless variations possible with china patterns. 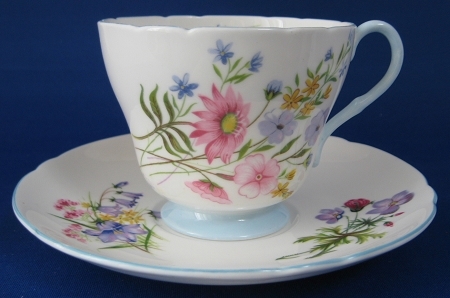 One of the thing I love with my Shelley obsession is the various combination patterns they have made over the years, or the differences you find due to the individual artist that painted or applied the decal to the teacup. Fascinating. These photos are of the artists at work in the Royal Patrician potteries in Stoke-on-Trent...unfortunately now closed. and the linky for your tea related posts. 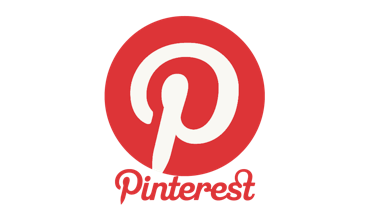 I'd be honored to have you link, and would love it if you'd leave a comment. Hi there tea loving friends and welcome to Tuesday Cuppa Tea, a meme built around the love of teacups and drinking...or taking...tea, as it was originally called. 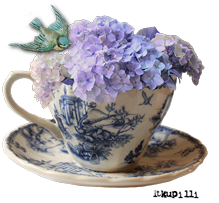 The list of some of the other blogs I am joining is at the bottom and the linky if you would like to add your tea related blog link. My teacup today is a teacup trio, or cup and saucer with matching plate that I got in a lot of estate china i acquired recently. I absolutely love the pattern! It has such a nice contrast between the green and white with the flowers. The pattern is called Blenheim, after the estate of the Dukes of Marlborough and the birthplace of Sir Winston Churchill, who, incidentally was the son of an American heiress who married into the family just like Cora on Downton Abbey. There is hand applied enamel painted accents on the floral transfers, nout not like the extensive hand painting done on the 1930s era Tuscan and Plant Tuscan china I love. But this is such a striking pattern! 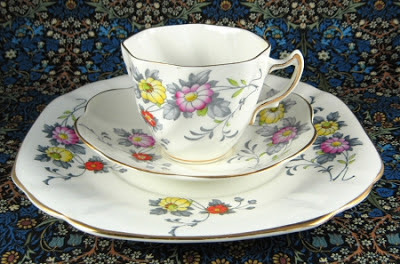 The teacup trio was made by Tuscan, England which was a trade name of R.H. Plant in the Tuscan pottery in Longton who also produced Plant Tuscan and Royal Tuscan and Decoro and ceased operations independently in 1962 when they sold all trademarks to the Wedgwood Group which used the name in a limited fashion until 1992. The pottery was completely shut down in 2006, when Wedgwood had further difficulties. 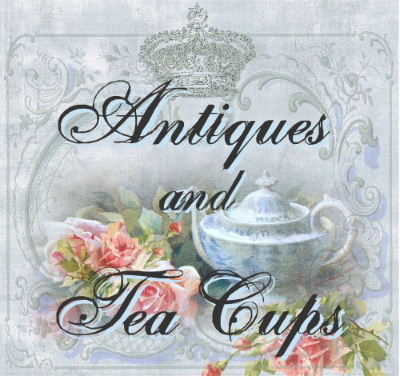 Available at Antiques And Teacups, just click on the photos for more info. 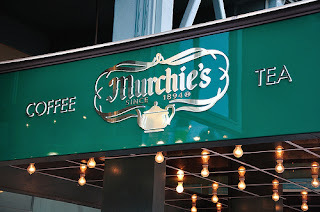 When we were in Victoria, BC last weekend for the Victoria Tea Festival (to read that previous post click HERE) we also had a visit to our favorite tea store, Murchie's on Government Street, an easy walk up from the Inner Harbor in Victoria. We always have to stop for tea and to buy some to take home. For tea we had a pot of Afternoon Blend and a Raisin pastry, as my honey had been thinking about Eccles cakes all afternoon. They didn't, of course have those quintessential English tea room delights, but the raisin pastry was as close as we could get. And of course we had to bring some home. We brought Afternoon Blend and Blend #10, my favorite. I tried to photograph the packages, but as they are in plastic wrap they came out light struck and distorted, so I gave up. Murchie's has a great selection of tea ware and teas, does their own blends and has a wonderful selection of sandwiches, scones and baked goods. It is always a pleasure to stop here. 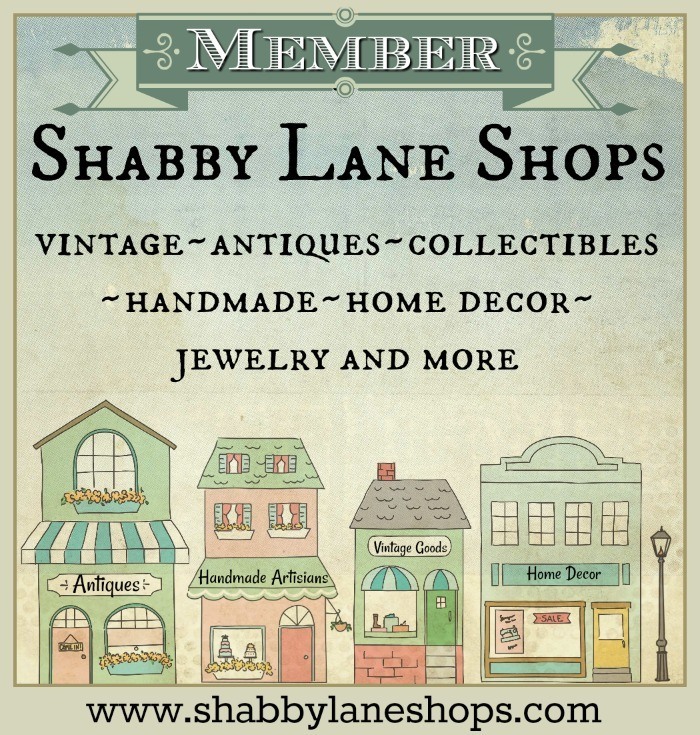 Here is the list of some of the blogs I am joining and the linky . Thanks so much for visiting Tuesday Cuppa Tea and have a great week! For Valentine's Day yesterday, my honey drove the 40+ miles to the Tea Room at Port Gamble, Washington. To make iteasier for folks living in the immediate area, there are morning and evening no-opening times for commuting and school schedules. At other times, you never know. There are websites and traffic cams all over and you can receive bridge opening texts, emails or phone calls. 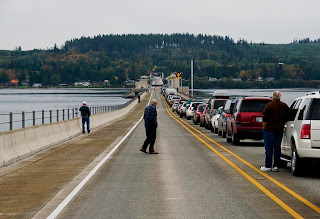 We don't cross it enough to bother with that, just leave extra time. 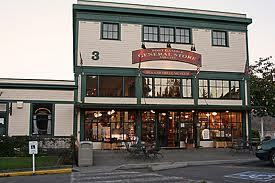 We were a bit early so we browsed the Port Gamble General Store, which also has a restaurant that was packed. The menu looked so good, we intend to drive over again soon and have lunch there. This is a lovely old Victorian home, empty now, across the street from the tea room. Lovely stained glass windows and gingerbread porch. This is an historical marker explaining who the town was named for, and below is the post office, that has operated continuously from the 1920s when mail was still arriving by ship. We had a marine layer come in...better known as fog...so it was a grey Valentine's Day. Inside the tea room, everything was lovely, and there was a classical guitarist playing. We first had our choice of about 50 varieties of tea categorized into black, green, white, herbal and decafeinated. I had my favorite, the Margaret Hope Darjeeling and my honey had English Breakfast. And here is the photo of the appetizers...which I didn't remember to photograph until I'd eaten all the balsamic strawberries surrounding the panna cotta!! Then the towers arrived...with sandwiches, scones and sweets. We ended going home with half of it in a box, along with our huge chocolate covered strawberries and chocolate raspberry truffles. Here is the truffle case you have to pass to get out!!! This is the owner Janis Kelley. What a sweetie! She is always such a joy, so welcoming and so gracious. She occasionally spontaneously serenades the patrons! Lovely! So we had a wonderful Lover's Lunch for Valentine's Day and our 39th anniversary. Lovely! 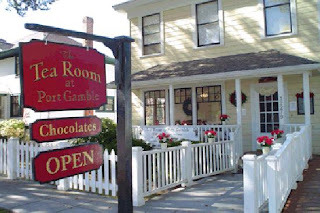 I would reccommend the Tea Room to anyone passing the area, which is a charming little town. 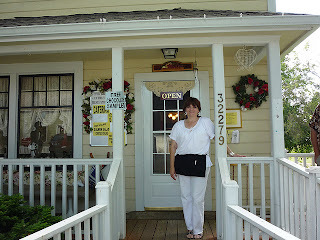 There is a great quilt shop there that we haven't visited as I am not a quilter, but have heard raves about locally. 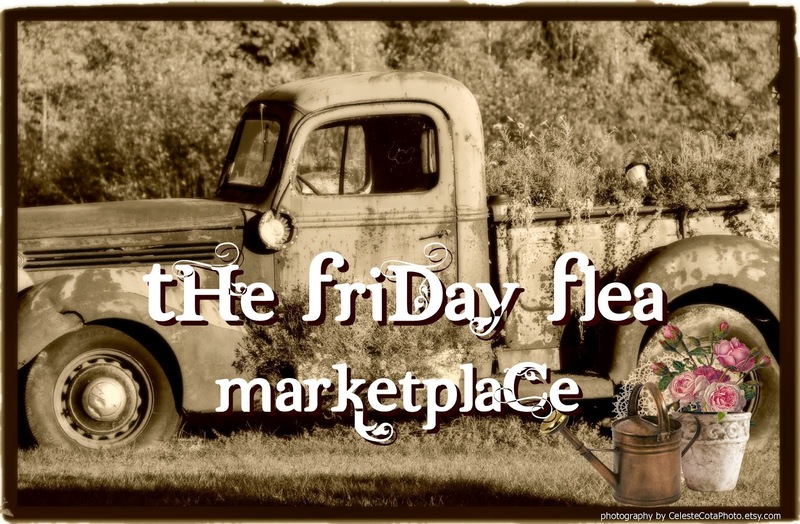 Have a great weekend...we'll still be celebrating our anniversary!